Man has created the necessity for deer management by eradicating the natural predators of deer - the wolf, bear and lynx. 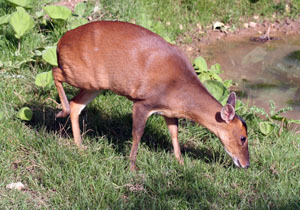 Escapees from deer parks introduced several non-indigenous varieties into the wild. During the two World Wars, when manpower was limited, deer parks were left in disrepair and escapee deer spread. 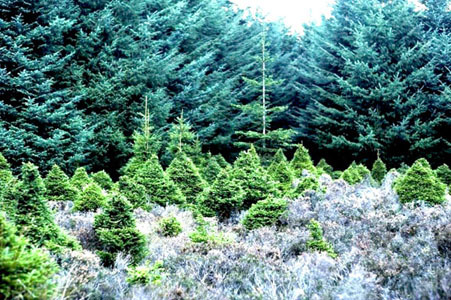 With the formation of the Forestry Commission, land owners were encouraged to plant trees. 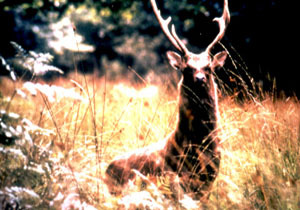 The aim was to create a national reserve of timber against future conflicts, but also created an ideal habitat for deer. Improvement in farming practices provided more food. Fraying (below left): damage done by territorial behaviour when deer rub and trash antlers on trees and shrubs. 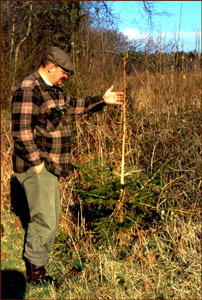 Browsing (below right): this is caused by the deer’s natural feeding and can kill or inhibit the growth of trees (note in the picture small trees are the same age as the larger ones). Has the effect of bonsai. There are numerous so called effective deterrents i.e. lion dung, sweaty socks, chemical agents and mechanical worriers, these are all short term solutions. The only effective control is proper deer fencing put in by qualified persons, bearing in mind that roe deer can get under an 8” gap. Proper fencing is expensive and is not cost effective on large woodland areas therefore most areas have deer culling taking place in some form or another. The gralloch (Scottish word for evisceration i.e. removal of internal organs) must take place within 30 minutes maximum or less in the summer, after being culled the carcass must be bled immediately to stop the carcass becoming unfit for human consumption, by law. This generally has to be done in the field depending on how far one has to travel and disposal of the head, feet and gralloch should be by burial in the field (ensuring it is not near a water course). Thus, taking other countryside users into consideration. Venison is one of the best meats to eat (recommended by the heart foundation) it is free-range meat with approximately 60% less cholesterol. The purchasing and eating of venison helps promote good deer management as they are looked at as a natural renewable resource instead of a pest. All six species produce good quality venison although there is a slight difference in taste between them sometimes, depending on what the deer have been eating and this can produce quite a unique taste. 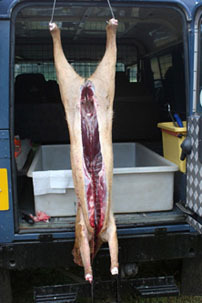 It is recommended that a carcass be hung for at least three days to help venison mature, hanging for longer would produce a stronger taste (this should always be in a fly and vermin proof area and at 7 degrees C). Red Deer (above left): One of our indigenous deer and the largest. 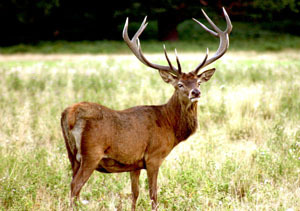 Sika Deer (above right): Introduced by the Victorians into deer parks and collections, medium sized deer. 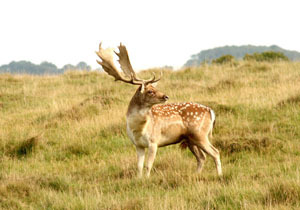 Fallow Deer (above left): Introduced by the Normans for food and hunting. Roe Deer (above right): The second indigenous deer, nearly wiped out in the Middle Ages but re-established itself. 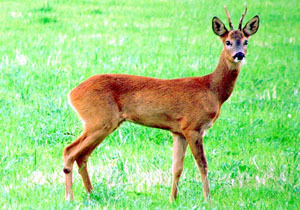 Muntjac Deer (above left): Introduced by the Victorians. 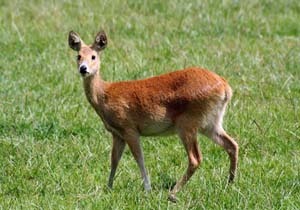 Chinese Water Deer (CWD) (above right): Introduced by the Victorians. If you wish to learn more about deer please contact The British Deer Society : (a charitable organisation for the welfare of deer who are equipped to educate people on all relevant subjects). A very useful and succinct summary of the main issues re deer and woodland. Thanks. Thanks for sharing this article. I’m doing some research for my client DeerBusters.com. We are trying to put together a large resource for alternatives for “Deer Control” and I found your article useful. I’ve read this article a few times and its still informative. We have been providing fencing services for rabbits and deer for a considerable time but the demand for deer fencing has certainly taken off. I suspect there are a number of factors involved in this. Being Cambridgeshire-based we dont get to see many of the UK’s larger species- most of or fences finish at 1.7m. Deer are becoming a major problem particularly here in the South East. This is a very useful and informative article. Thank You. A very factual and accurate account of deer and deer management. I found the info: contained very informative and would be of use to anyone who had no knowledge of deer and some of the problems we have created by introducing non-indigenous species. Also I agree that culling is the only effective way of control for the benefit of deer themselves, other animals, woodland, crops, and to counteract the bad publicity deer are attracting at this time. An excellent summary – nice to see people writing about Deer who know what they are talking about! I particularly agree with the the comments that Deer Fencing or a Deer Cull are the only truly effective methods to control deer. There are too many products on the market promising to solve deer problems that simply don’t work. It was interesting to read the comments on the necessary management, damage caused and types of deer. 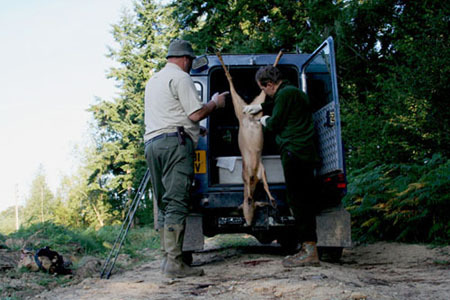 I am a Deer Stalking Certificate Level 1 Holder (DSC1) and have been stalking for a number of years. The information given is precise, accurate and informative. I am a member of the British Deer Society (BDS) the Woodlands Trust and RSPB to name but a few. I can personally recommend Venison, it is a fantastic meat and is similar in flavour to beef.